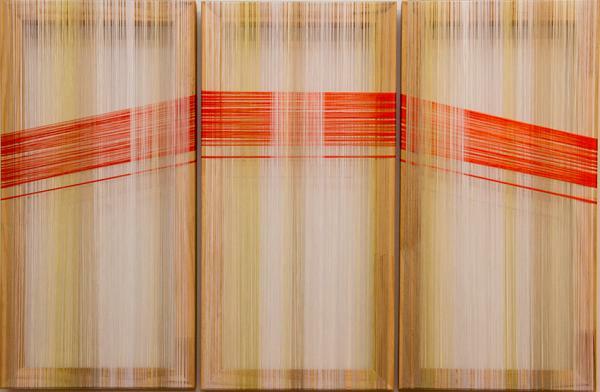 Artist and TLC Diploma of Art and Creativity (Advanced) graduate, Jane Toy, exhibited work recently at the Fine Arts Whanganui Gallery on Taupo Quay. I spoke to Jane Toy last week after the success of her exhibition opening night at the Fine Arts Whanganui Gallery. A talented TLC graduate, she credits The Learning Connexion in helping her get to where she is today. Jane Toy is a Whanganui artist with a B.A. in political science, who specializes in creating abstract works of art with optical twists. She quite literally ‘draws’ and ‘paints’ with thread and wool. She is a mixed media artist who is in essence a ‘painter’ of abstract pieces. Living in Whanganui, Jane studied art and creativity at The Learning Connexion long distance, part-time until her final Diploma year. Studying full-time art in her last year gave her the time to engage with everything the school had to offer. It also gave her the ability to fully explore the theory behind the materiality and the process of her art making. Exhibiting artwork can be a lot like showing someone else what’s going on inside your head. Jane Toy’s is clearly packed full of vibrant colours, shapes, patterns and lines. 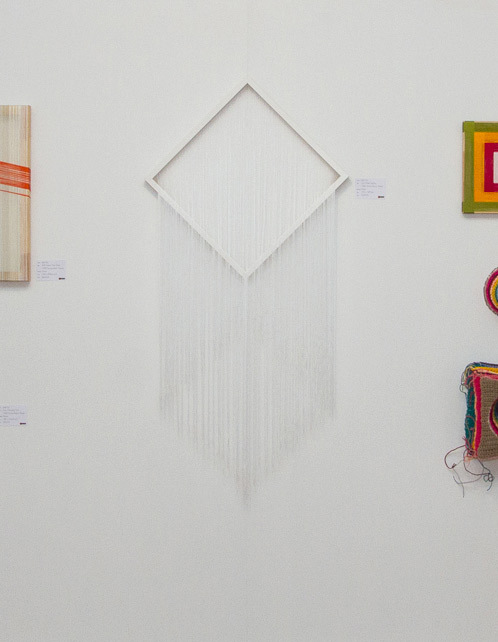 For her, this recent exhibition must have been a pure indulgence, allowing her to immerse herself and the viewing public in brightly coloured hues of thread. 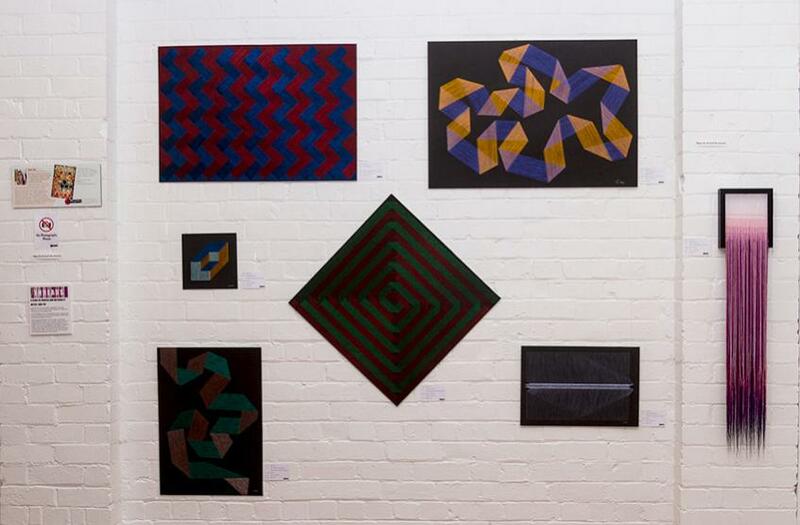 Much of Jane’s work stems from her love of Euclidean geometry. 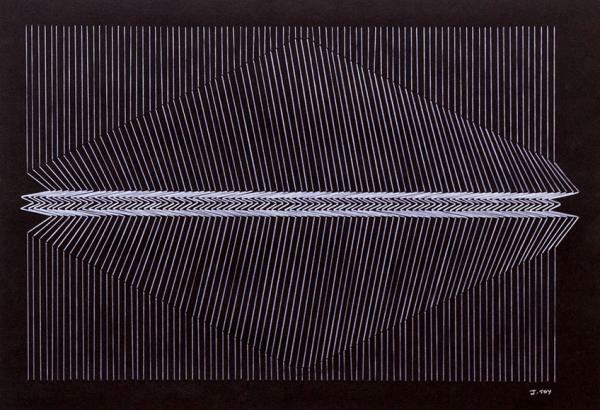 As an artist she plays with line, colour and shape to create interesting optical twists and turns for the viewer. She creates strong, vibrant works of art, simplifying complex forms, or conversely complicating simple ones. Not one to shy away from using complicated colour combinations, Jane revels in the broad approach that abstract art allows. Jane’s art in the exhibition is based on a continuation of the work done during her Advanced Diploma at TLC. She did a lot of experimental work during her final year, pairing it down during the last six months to the final 16 pieces on display in the Fine Arts Whanganui Gallery. Artist’s description: Because I use colour as a material, all of the works I’ve done are highly coloured. With this piece I just tried to pare it down, then pare it down again, and eventually I did something without colour. This work operates with gravity, outside of the frame and below the frame, and with the absence of colour. The threads create a ghost image using shadow. There is a lot of movement to it, as with the threads hanging down, the breeze throughout the gallery operates within the work. It’s a lovely, very calming piece. Jane’s art making approach is to take the conventions of painting and drawing and get the same feeling as paint; to achieve a painterly finish, much like a brush stroke or a drawn line, but without using paint or pencil. Rayon viscose thread is used throughout her body of exhibition work. This thread is very fine. When it sits alone it becomes almost transparent in quality. However, on the spool the thread appears very dense and richly pigmented. Jane plays with the layering of her threads of colour to create other tones and colours. It’s like an optical game – illusions with thread. 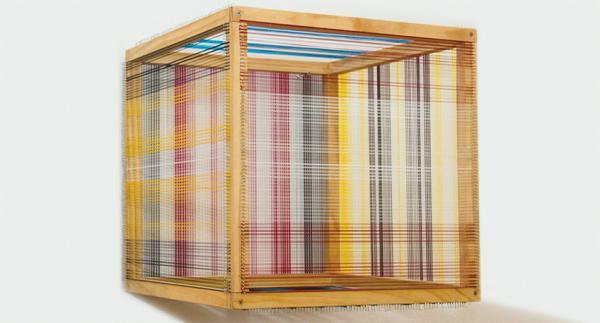 Threads sit next to each other, bound tightly and visually mix, becoming another hue. If just one thread is out of order it can ruin the entire piece. Jane’s art clearly requires a lot of precision and an eye for detail. Working with the thread as a medium is very immediate. Jane often relies on the blending of the two different tones of thread and this results in colours that can be quite surprising. She explains that you have to make decisions about what colour threads you are going to use – say red, yellow, black and orange, but then you have to apply the process. It is that process that can be fascinating and quite out of your control. This is the difference to painting. In painting you add a little bit of red, a little bit of yellow, etc, and you are making that decision. But with threads, the material becomes part of the decision. It makes the decision for you. Each time Jane finishes a piece of work she asks herself… “Am I doing what I want to be doing?” “What is it that I actually really, really love in my art pieces?” Then she starts to work with and pare back those elements. It’s this constant questioning that leads to, and forms, the next piece. Following the success of this exhibition, Jane is looking to take colour further than before. She will be using threads again, but channeling even more of what went before. Jane Toy wants to take users and have them completely immerse themselves in colour – to get right inside it.It’s fascinating to think of the possibilities and where this will lead. I’m excited to see. 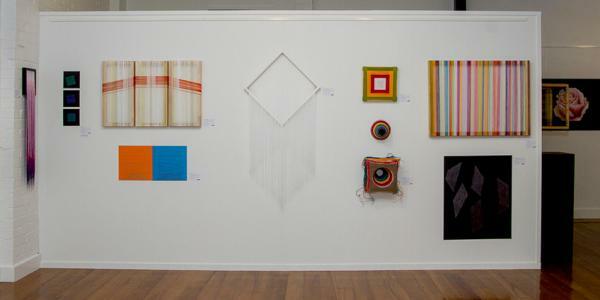 Threads exhibition at the Fine Arts Whanganui Gallery. Call The Learning Connexion School of Art and Creativity on 0800 278 769 or request a prospectus to find out more about becoming a professional artist. Gain NZQA qualifications in transferable creativity through the vehicle of art. Our art programmes are practical, hands on and include many popular fine arts processes including painting, drawing, 3D, printmaking, jewellery, computer graphics, video and more. Is painting dead? Is it in its final death throes, or has it merely gone underground? What do you think? Tell us your P.O.V. Golden Bay artist and TLC Diploma of Art and Creativity (Advanced) graduate, Oli Gedye, creates tactile three-dimensional sculptures and kinetic sculptures that combine music and art. TLC graduate Ben Smith creates wearable sculptures and contemporary pieces of jewellery. He re-purpose old and found items, transforming the ordinary to the extraordinary. Photography tutor Marc Hill spends his spare time he’s been up high in the air, as well as on the ground, taking photographs and filming helicopters.